It is very difficult for the users to fix an error. Same goes with the Access Database Error 2950. 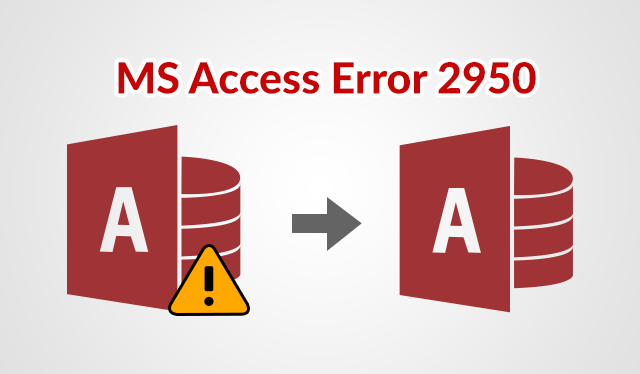 It is quite difficult to resolve the error but in this write-up, we would be discussing the reasons behind the error, its precautionary measures and how to restore files damaged by the Microsoft Access Database Error 2950. As MS Access is a database management system package from Microsoft, it has many amazing features that make it vital and globally spread database system. Microsoft Access comprises of the Relational Database Engine via Graphical User Interface and is widely used for the development purpose. Database tool of Microsoft is used a lot in terms of building the software application and suite by many developers of software and the system architecture people. In addition to it, Microsoft Access is very handy database used for auditing and the analysis purposes. But, there are many flaws in the MS Access system like it is more prone to risks, vulnerable to many unwanted errors and these things makes the data inaccessible. My circle has used MS Access for ages, but, the main problem is caused due to macros. Macros are simplified programming language that is used in case of building list of actions. But sometimes, the case is totally opposite as it is a programming language and directs to the Microsoft Access Database Error 2950. The error can also be termed as Action Failed Error Number 2950. There are many causes because of which this error is generated in MS Access. The Error Number 2950 Microsoft Access 2003, 2007, 2010, 2013 occurs in all these versions. The Microsoft Error Code 2950 happens because of the Trust Issues. For instance, if a user launches an unknown source database and it is not trusted by Access then the probability of this error increases. In addition to it, MS Access works in a disable mode for accessing the non-trusted databases. In the disable mode it is very difficult to access the executable content, which causes the error. The method is only applicable for the database of current session. The session is terminated when users hit on close command. The above-mentioned steps provide the users with ways to fix Microsoft Access Database Error 2950 manually and completely free of cost. It happens because of the corruption problem. But these methods have a limitation that it does not work if the database is corrupt. In case the manual method is a failure user can opt for the third party approach. Sometimes, making use of a recommended solution is preferred most while tackling the errors. The MS Access Recovery Software is one the finest way to recover and restore the corrupt ACCDB and MDB files comprising of OLE, MEMO and BLOB data. Users can easily rely on the tool for restoring all problems related to MS Access, be it corrupted database or Microsoft Access Database Error 2950. Every technology works on certain guidelines and needs to follow the principles and commands for resolving the issues. Every program has complex coding and sophisticated designs but behind it is smooth running algorithms. Many times, the situations occur where the algorithms cannot escape the corruption issues and thus cannot save the database files from malfunctioning. If you are well equipped with the technical stuff then, in that case, you are able to resolve the Microsoft Access Database Error 2950. But it is really difficult to have knowledge of each and everything as computer is a vast topic to explore. So, it becomes troublesome to resolve the error. In such matters, the best approach is a making use of a professional tool. The automated solution is one of the finest approaches to resolve the problems. Recovery software is less complicated and is easy to use, understand and is effective in many methods. So, the users must give our MS Access Recovery Software a try to resolve the issues that manual method cannot repair.